Brand Kenya Board is mandated to coordinate initiatives for marketing the country in order to maximize their efficiency, to create and maintain the Kenya Brand and to identify and distinguish Kenyan products, services and concepts. In line with our mandate of identifying and distinguishing Kenyan products, services and concepts, the board has embarked on an initiative of branding goods and services that originate from Kenya. 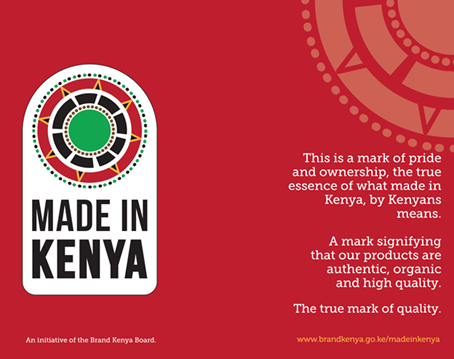 A unique identifier for goods and services originating from Kenya has been created; The ‘Made in Kenya Brand Mark’. The term ‘Made in’ describes where products originate from. It denotes an association with the place of origin. The ‘Made in Kenya Brand Mark’ signifies that our products are unique, authentic and of high quality. The initiative aims to define the value proposition of our goods and services as well as communicate the promise/benefits to consumers, work with producers /manufacturers to commit towards exceeding the promise by delivering with excellence and finally leveraging on the brand equity built thereof. To enable consumers locally and abroad immediately identify a product as Kenyan and then associate the product with quality and authentic Kenyan value. To create a strong brand proposition for Kenyan made goods and services centred on quality and authenticity. To enhance the competitiveness of products made in Kenya at the local, regional and global market. To strengthen Kenya’s position as a Made-in Country Brand in light of the Big Four Strategy where Kenya seeks to position itself as the Industrial Hub for Africa. To enable the implementation of section 155 of the Public Procurement and Asset Disposal Act 2015 which gives preferential procurement to manufactured articles, materials and supplies partially mined or produced in Kenya or where applicable have been assembled in Kenya. There has to date not been away for procuring entities to identify the above products. Log on to http://madeinkenya.brandkenya.go.ke/ to apply for the mark.